We have recently welcomed to the world, our precious little Izabella. She is our second child and is very much loved after two previous losses. We lost a little girl at 19 weeks last year due to Trisomy 15, so when we found out that there were abnormalities at our 20 week scan this pregnancy, we were devastated. Thankfully, due to our history, we were seen by a specialist straight away and were reassured that it appeared to be a developmental abnormality, rather than another chromosomal condition. Any news after that was actually a relief. Obviously everyone wants a baby that is healthy, with 10 little fingers and 10 little toes, but knowing that our little girl would have some physical differences, actually seemed like good news, as she would be alive! We were told that her left arm had not grown past her wrist, but we wouldn’t know any more than that until she was born. Being a fairly pro-active person, I requested a referral to the Limb Deficiency (I really don’t like that word!) Clinic at the children’s hospital and also got in touch with Limbs4Kids. I was blown away at how much support there is available for families like us and it really put our minds at ease, knowing we could connect with other families and have professional support so easily accessible. During our pregnancy, we only told family and friends who have a regular presence in our life, as we didn’t know whether there would be any other issues discovered after birth. Initially we weren’t telling people the gender of our baby, but it felt strange calling her ‘it’ and ‘the baby’. We were really clear that we wanted her to be welcomed into a loving and accepting community and having an identity before she got here, was important. In hindsight – it would always have been that way anyway and people’s reactions have been nothing but positive and supportive. The most challenging conversations were with our two year old. We wanted her to know before her sister was born, so that it wasn’t a shock for her. Again, in hindsight, we made much more of this than it needed to be. Our daughter asked one question at the hospital about her baby sister’s hand and has never mentioned it since. It has surprised me at how accepting the kids have been. It is usually adults that ask questions and offer (often unsolicited) advice. My mother bought a doll and removed its left hand. This gave us a talking point for our daughter, but it was really just an abstract concept for her. 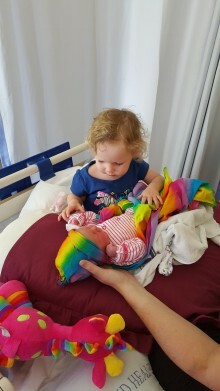 Her sister arrived two weeks after her due date, so I think she was beginning to wonder if we were actually even telling the truth about this mythical baby! At our first hospital appointment after Izabella was born, they gave us a doll with an arm that comes off. We have decided to keep this for Izabella when she is old enough, as her sister is doing just fine on the understanding and acceptance front! We have discussed and requested that people use words such as ‘different ability’ rather than disability and ‘limb difference’ rather than limb deficiency. As she is still so little this hasn’t really come up yet, but it will be good to have consistency as she starts to talk about it and understand it herself. One of the biggest considerations for us was what (if anything) to share on social media. I have a social media company, so I know the amazing benefits, but also the shadow side of social media. I was quite concerned about creating a digital footprint for our little girl that might limit her opportunities in the future. There were also many connections on Facebook that we hadn’t told yet, because we hadn’t seen them. Initially every photo we shared just didn’t show her left hand. That started to feel weird. I definitely don’t want Izzy growing up feeling like it was something we hid or were embarrassed by. So after much discussion and asking for people’s advice, opinions and experiences, through the Limbs4Kids Facebook page, we decided to do a post that just explained her little hand and since then have not worried whether photos do or do not include her hand. All of our connections are people we are related to or know well and we have security settings fairly tight. The great news is that although her left arm is shorter than her right and her muscles are a little under developed, she does have a wrist joint and a small pad like the palm part of her hand. So the likelihood is that she will only need a prosthetic if there is a particular sport or musical instrument she wants to play. She is perfect in every way and a very happy and contented little soul at just five weeks. The adventure is just beginning! Limbs 4 Life thanks Kate for sharing her heartfelt and informative story. Congratulations to Kate and her family on the arrival of little Izabella!